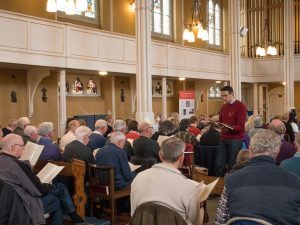 In November 2016 at the end of the first Come & Sing Day with the newly restored Willis organ we asked all the singers to choose what they would like to sing in 2017 and 2018. Haydn's Nelson Mass was the top choice, closely followed by The Armed Man so for 2017 we picked Haydn. 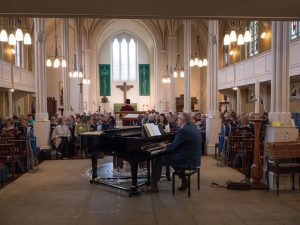 This was Jonathan Kingston's first Come & Sing Day at SMSG and right from the start he had the full attention of 130 singers as he took us through the Mass movement by movement. 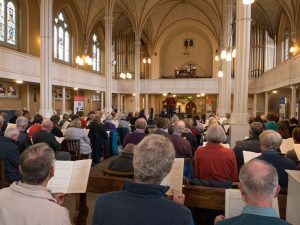 Many of the singers had not tackled this piece before but were soon enthusiastically sight-singing, others had sung it before and provided helpful support to those who were new to the piece. I had personal memories of hearing it performed liturgically several times at the 11.00 am monthly Sunday morning High Mass at St George's Cathedral in Cape Town when I was a child but had never sung it, and found it was like greeting an old half remembered friend. 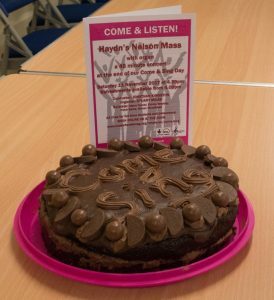 During the day we had tea and cake breaks and a lunch break, expertly run by the big team of volunteers in both the hall and the church, to keep the queues down. Under the leadership of Janet W, the Come & Sing team had reviewed feedback from previous years and decided that to reduce heat loss from the church and to keep the singers queuing for music at the start of the day in the warm, it made sense to ask singers to enter via the Parish Hall rather than the West door, definitely an arrangement we'll repeat in the future. 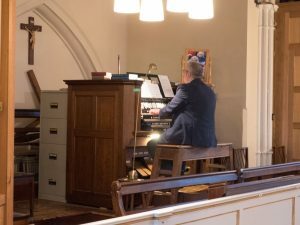 Throughout the day as we learned the different movements of the mass, we sang with the piano then the organ played by Stuart Miles, who did a very good job accompanying us. 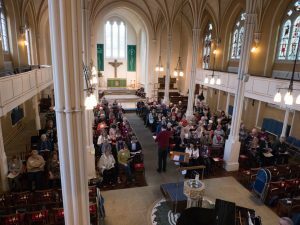 In the afternoon the four soloists - Claire Turner (soprano), Emma Westley (alto), Peter Eales (tenor) and Simon Woodhead (bass) joined the final rehearsal before the tea break. Nearly 50 people came to hear the performance at 4.30 pm which went really well. I would like to thank Janet and all the Come & Sing team and volunteers for making this such an enjoyable day. 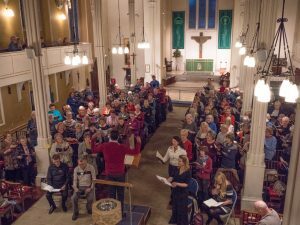 Feedback from the singers was overwhelmingly positive with many specifically mentioning Jonathan as a very good, enthusiastic conductor. 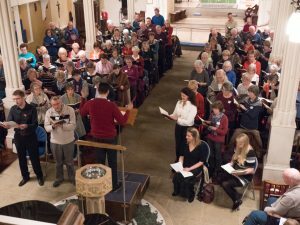 Planning is already under way for the 2018 Come & Sing Day which will take place on 10 November 2018 when we will sing the Armed Man Choral Suite by Karl Jenkins as well as Parry's Blest Pair of Sirens.